Following the record-breaking success of Roaring Currents, Choi Min-sik returns to screens in another big-budget period epic, this time hunting down the last Korean tiger (as opposed to the last tiger in Korea, because this feline clearly has a national identity) in Park Hong-joon's end-of-year release The Tiger. Chun Man-duk is a hunter in early 20th century Korea, training his son to follow in his footsteps during the Japanese colonial period. Along with other local hunters, Chun is charged by a Japanese commander with hunting down the last remaining tiger on the peninsula in Jirisan (now a national park in Southern Korea). While the above synopsis is simplistic, and glosses over much of what happens in the first hour, by the time the second (and better) half comes into focus, this is essentially where the narrative stands. A 'great tiger' (the title of the film in Korean) stands against the might of the evil Japanese empire, with Chun acting as a reluctant participant until he forges his own path. 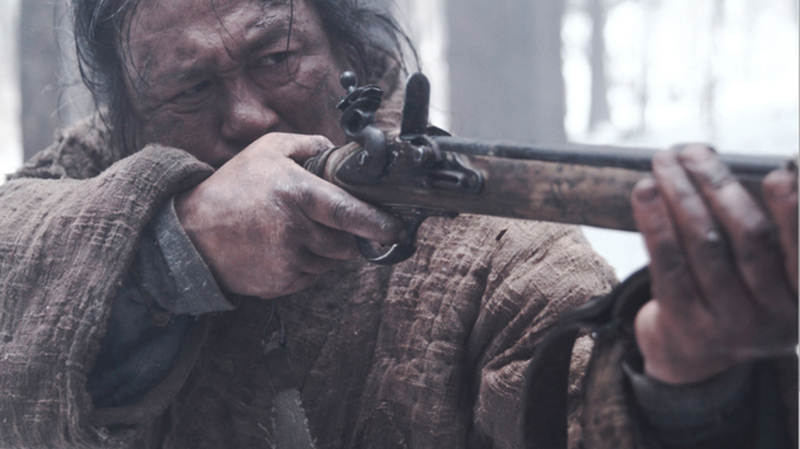 Following Roaring Currents and other recent hits Ode to My Father and Northern Limit Line (and perhaps even The Himalayas, which opens on the same day), The Tiger sadly follows a pattern of historical revisionism that has become mainstream in contemporary Korean cinema. The almost mythical beast of the title (which Chun believes to be a mountain god) has an uncanny ability to differentiate between nationalities, and while he mauls anyone that comes in his path, it is the Japanese oppressors for which he reserves his most savage attacks. In the past, there have been those who have championed Park Hong-joon as a scriptwriter (his credits include Ryoo Seung-wan's The Unjust and Kim Jee-woon's I Saw the Devil, both 2010) while dismissing him as a director. His period chamber piece The Showdown (2011) was an inauspicious start, while his modern gangster hit New World (2013) was a tightly scripted affair boasting a on-point cast, but his latest, which sees him working on his largest canvas to date, may actually suffer from the opposite problem. His script is littered with metaphors and high points, but it also sports a glacial middle act and dips too often in anthropomorphisms and the fantastical, all the while trying to maintain a feeling of historical authenticity. In a role that seems tailor-made for him, there was scarcely any doubt that Choi Min-sik would deliver the goods as Chun. Sure enough, with his hulking, arched physicality and a craggy mien that appears to be carved from stone or wood, depending on the lighting of a particular scene, Choi is a formidable presence and the only person you would want to see in the role. Beside him as a rival hunter, Jung Man-sik (Veteran) gets his biggest role to date, and while he looks the part, he never quite rises to the material. More convincing is the ever-affable Kim sang-ho (Haemoo) whose emotional range is put to good use here. Then of course there's the tiger. A cgi creation that at first flits through the background before appearing at length in its full form, the visual effects team does a fine job bringing the creature to life. However, the perhaps rushed work on wolves and tiger cubs, particularly how they move, is less impressive. Forgetting its' nationalistic leanings or narrative machinations for a moment, where The Tiger truly thrives is in its technical specs. Director Park is owed some credit for shaping the various elements into a more-or-less fluid whole, but its the individual participants that really shine. Cinematographer Lee Mo-gae (known for shooting most of Kim Jee-woon's back catalogue) does some of his very best work, injecting an old-timey grandness into the hills of Jirisan. Whether swept by snow, filled with fog or teeming with thin tree trunks, Lee's images are constantly arresting and the way his camera either cautiously creeps from the hunter's perspective or leaps through the forest when from the tiger's point of view fuel some of the film's most dynamic scenes. Also on top form is music director Jo Jung-wook (Park Chan-wook's frequent collaborator) whose domineering orchestral swells (recorded at Abbey Road), squeezed to maximum effect with squealing old Korean horns, afford the picture a truly epic feel. If The Tiger aims to show us anything, it's a venerable hunter and an honorable tiger (whose fur is coated by the blood of 100s by the film's end) performing a thrilling and gory two-step dance, as they preserve the integrity of the peninsula and basque in the magnificence of the Korean outdoors. It's a daring manoeuvre to be sure, and one not without its flashes of brilliance, but its overzealous patriotism and the fantastic liberties taken in its plot frequently threaten to veer it off the rails. It will be up to individual viewers to decide whether it stay on course, but there's no denying The Tiger is a singular, epic work with much to admire.